The Cruiser Mk. IV is a British tier 3 light tank. In game, this tank has excellent gun depression, superior even to the M4 Sherman. The QF 40 mm Mk. VI is very effective at its tier (100 average burst damage, 200 average clip damage), capable of crippling most tanks up to tier 4. The QF Mk. VI gun fires its burst significantly slower than most other autocannons which can be somewhat disorienting, though the second shot is less prone to firing wildly off-course. Overall, this is a very effective tank and great fun to play with. The Cruiser Mk. IV leads to the Covenanter. Top gun does good damage and is very accurate for an autocannon. Only 6 seconds to reload the clip, short for any auto-loader, allowing for you to easily change ammunition without penalty. Top gun fires more slowly than most other autocannons, requires some practice to get it right. The somewhat low top speed doesn't allow you to make the most of your great power/weight ratio, and it may be frustrating. A step up in the world from the A13 Mk. 1 (III), the A13 Mk. II (IV) is an up-armored version. The 40 mm Pom Pom now fire 2-shot bursts and the new QF 40 mm Mk. VI auto-cannon is available, along with an improved engine. However, the hull traverse, especially at high speed, is just as sluggish as on the A13 Mk.1 (III), so making tiny circles at high speed with this tank is virtually impossible. Also, the QF auto-cannon has very unstable penetration, and will bounce many shots that you expect will penetrate, so make sure that you aim at the weak spots. Sniping is negated by the relative inaccuracy of the 40mm Pom Pom, forcing the tank into Close Quarter Combat. It is recommended to upgrade the Pom Pom whenever possible. All this said, the QF 40mm Mk VI works extremely well for the role the Cruiser Mk. IV plays. 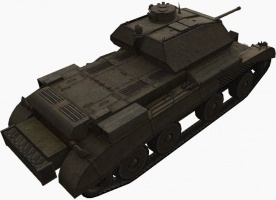 For anyone experienced with medium tank tactics, this tank will feel very familiar being fairly sturdy for its tier while being fast, maneuverable and having a great gun that's extremely well suited for flanking. Being able to burst fire 4 shots of the same caliber most tanks at your tier shoot one at a time allows you to dominate anyone at your own tier, put a huge hurt on anyone tier 4 and be able to flank and kill any tier 5 (although it might have trouble penetrating a KV-1, so leave more heavily armored enemies for your team.) Additionally, the top gun is quite accurate for an autocannon, and will allow you to use its huge DPM and penetration for its tier at a mid-range sniping setting. This is very deadly indeed. Equip the 40mm Pom Pom from the previous tank, and focus on the tracks and engine. Then focus on your turret and the QF 40mm Mk. VI. Finally, research the radio if you haven't already from the previous tank, or proceed to the A13 Covenanter. Cruiser, Mk IV (A13 Mk II) was a British cruiser tank of the Second World War. It followed directly on from the Cruiser Mk III (A13 Mk I) tank. The first Mk IVs were Mk IIIs with extra armour fitted to the turret. Later Mk IVAs were built with the complete extra armour. The tank was used in France in 1940 and in the early part of the war in North Africa before being withdrawn from service. Britain became interested in fast tanks after observing the Soviet BT tanks during the 1936 Red Army maneuvers. The BT was based on the revolutionary designs of American J. Walter Christie, and so a team from Morris Motors was sent to the United States to purchase one of Christie's tanks, and also the rights to build more. The tank purchased became known as the A13E1, and this was delivered in late 1936. However, the hull was too small and this led to a second British-built prototype being constructed. 0The A13E2 was built to mount the turret of the Vickers designed Cruiser Tank MkI (A9). This carried a 40 mm 2-pounder anti-tank gun and co-axial .303 water-cooled Vickers machine gun. The drive train was also revised, with the road wheels no longer powered - as a result the tank could not be driven on its wheels alone. Better tracks were used, with rear-mounted drive sprockets; on trials over 40 mph was attained on these tracks, but later the speed was governed to 30 mph. The armour basis of the A13E2 was 15 mm, in line with other pre-war fast tank designs. The A13E3 was the final trials model; this led to the production tank, the A13 MkI, Cruiser Tank Mk III, which entered production in 1939 at Nuffield Mechanization & Aero Limited, a munitions subsidiary of Morris Motors. An order for 65 tanks was placed; and at least 30 tanks completed when the War Office decided to build a new model with thicker armour. 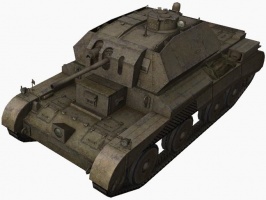 The A13 MkII, Cruiser Tank Mk IV, had a maximum armour thickness of 30 mm, and faceted armour was mounted on the original turret's sides and rear. This gave the tank a far more modern appearance. Some Mk III tanks were re-built to Mk IV standard while at the factory. In service, the .303 Vickers machine gun gave constant trouble, and so the British Army decided to replace it with the 7.92 mm BESA. All British tanks were to have their designs modified to mount the new weapon from early 1940. 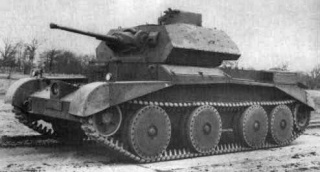 This led to the main production version, the A13 MkIIA, Cruiser Tank MkIVA. A few examples of this model were sent with the BEF to France, along with most of the earlier A13's so far produced. It is not known how many A13 MkIVA tanks were produced; numbers depending on source. Between the Cruiser Mark III and Cruiser Mark IV, 665 were produced when production ended in 1941. English Electric, Leyland, and LMS Railway were also involved in A13 production. In France the A13 did not do well; this was mainly due to poor training as a result of its being rushed into service. Many tanks shipped to France were in poor condition, some so new they had vital parts not yet installed. However, the A13 did much better in the deserts of North Africa, and coped with the conditions better than some other designs. It was fast, and its 2-pounder gun was a fine weapon against Italian and German tanks of this period. It stayed in contention as a battle tank until late 1941, when newer models of the Panzer IIIand Panzer IV appeared with thicker armour and larger guns. 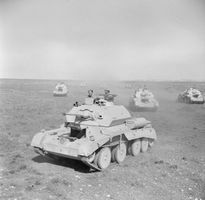 In North Africa it was the anti-tank gun which claimed the vast majority of British tanks lost in battle; German tanks accounted for few British losses, contrary to popular belief. 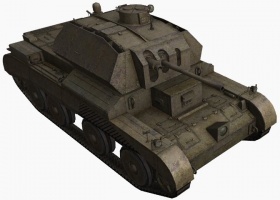 The A13 MkIII, Cruiser Tank Mk V was a radical departure from the original A13 design and constituted a new tank. Both hull and turret were redesigned, and it used a new flat-12 Meadows engine with radiators mounted in the front hull. Named the Covenanter, it was built in large numbers, but was not battleworthy and was used only for training. 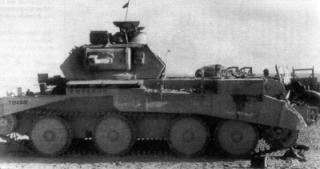 The A13 MkIIA was replaced by the A15 Crusader tank, which was similar to the Covenanter but used the original A13 engine. The Cruiser Mk IV and MkIVA, in small numbers (40?) saw service in France in 1940 with the 1st Armoured Division of the British Expeditionary Force. Most were abandoned at Calais, and the few tanks that did see action were overwhelmed by the vastly superior German forces. From October 1940 the Cruiser Tank MkIVA was sent to North Africa, where it served alongside the older A9, Cruiser Tank MkI and A10 Cruiser Tank MkII. The A13 was never available in sufficient numbers, and a typical Armoured Brigade would have a mix of slow (10-20 mph) A9 and A10 with faster (30-40 mph) A13 and Light Tank Mk VI (acting as cruiser tanks). This gave tactical and logistical problems. However, the A13 was popular with its crews, and its only real drawback was the lack of a high-explosive shell for the 2-pounder. Like all British tanks of the period, it was vulnerable to anti-tank guns, which it had no way of countering except by short-range machine gun fire. The A13 was generally reliable, and the 2-pounder gun was adequate against all Axis tanks up to late 1941, when the A13 was retired. 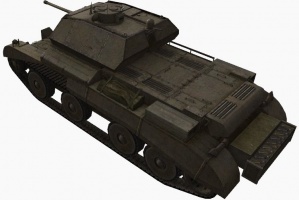 It was replaced by the A15 Crusader tank, which was in essence an enlarged A13 with thicker armour. This page was last modified on 8 May 2017, at 17:26. This page has been accessed 122,064 times.